The mission began at sunset. After a quick briefing to receive assignments and equipment, 26 staff and volunteers spread silently out to their locations. In the entrance breezeway, near the tram garage and underneath trees, they hunkered low on the ground as darkness grew. They waited, breath hushed. And then, with a chattering and creaking overhead, the mission began: The Great Trek Bat Count of 2018. Darkness falls as staff and volunteers prepare to count bats. As bats began to fly out from their roosts into the night to hunt, the humans sitting quietly below them began to click their counters, one for each outgoing bat. One staff member had a bat detector device, another a night-vision scope. Data was recorded. Finally, as the darkness became complete and the last bat flew out, the mission was over – at least, for now. 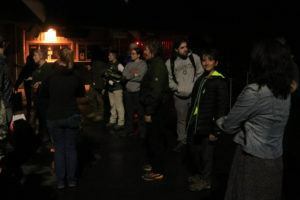 It sounds like a scene from a 1980s superhero movie, but what was happening on June 29 and July 6 around Northwest Trek was actually important science – counting bats, along with other sites around Washington. The goal? To give biologists at the Washington Department of Fish and Wildlife (WDFW) a greater understanding of these little-known mammals – and the challenges they may face to survive. But, of course, it was also a great opportunity for superhero jokes. Trek keeper Wendi Mello and her son with their bat count data sheets. 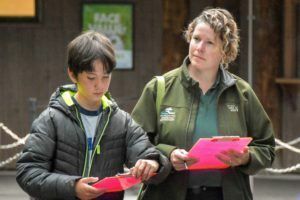 Northwest Trek zookeeper Wendi Mello and her 12-year-old son had a slightly different – but still rewarding – experience. So why is Northwest Trek counting bats, anyway? White-nose syndrome is a disease that has spread quickly in eastern North America over the last decade, killing over six million bats and wiping out entire colonies. A fungus that grows on the noses, wings and ears of bats during winter hibernation, it gets its name from the white, fuzzy appearance it may give the suffering animals. Invading deep skin tissues, it irritates the bats as they hibernate, waking them so they burn through the fat reserves they need to survive. Now it’s here in Western Washington: The first diseased bat was found by hikers near North Bend in March 2016. Getting a better knowledge of bat populations – their numbers, locations, species and behavior – is crucial to understanding the disease, and helping to stop its spread here in the West. Northwest Trek’s research will help protect bat populations. But it takes a lot of people to count that many bats. Armed with clickers (and aided in dark places by red lights that wouldn’t disturb that bats), each person at the count clicked once for every bat they saw emerging from the roost. Then conservation engagement coordinator Rachael Mueller averaged out the counts. An average of 852 bats were counted on the first night; 613 on the second. Hawn alone, stationed at the entrance breezeway, counted 173 bats in 20 minutes alone. “Our colony is definitely larger than anticipated!” said Mueller. For the rest of the time, though, Hawn was operating another device that lent the bat count an air of superhero nerdiness: a bat detecting Echometer, aka a microphone connected to a tablet app. The microphone records the high frequency sounds bats make to echolocate their food (far above what humans can hear, although we do hear their vocal chattering). 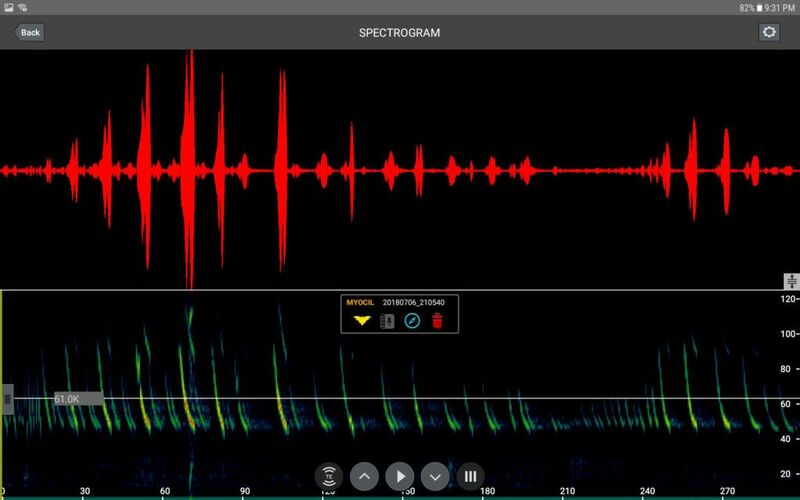 Then the app, made by Wildlife Acoustics, analyzes the sounds to identify each bat species. Among the species heard at the Bat Count: little brown myotis, silver-haired and Western small-footed myotis bats. A screenshot of the spectrogram showing bat calls in the app Wildlife Acoustics, recorded at Northwest Trek. For Povey, the survey – which will happen again next summer – raised some interesting scientific questions that could be answered by ongoing counts: Are species co-mingling? Do bats show fidelity to specific roosts or do they roam? Are they increasing in number? It’s all-important knowledge about a creature that is crucial to humans. But Povey also sees a closer connection to Northwest Trek itself. Report groups of bats you see to WDFW. This information will help them understand bat populations and monitor white-nose syndrome in Washington. Do not handle live bats. If you find a sick or dead bat, please report it to WDFW using their online reporting form. Avoid entering areas where bats may be living to limit the potential of transmitting the fungus that causes the disease and disturbing vulnerable bats. Get involved in bat conservation! Help improve bat habitats by reducing lighting around your home, minimize tree clearing, and protect streams and wetlands. Try to incorporate one or more snags into your landscape keeping old and damaged trees when possible. Snags provide important habitat for bats and other backyard wildlife. For more information on living with bats, and instructions on how to build a bat house, visit https://wdfw.wa.gov/living/bats.html.